Occupy for "Fair Trade, not Free Trade"
DALLAS – Talk of a major international protest dominated the discussion at the Occupy Dallas Six-Month Anniversary Celebration at Pioneer Park downtown on Apr. 7th. 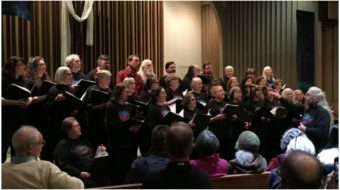 Proposals were flying for a response to proposed Dallas negotiations May 8-18th for the so-called “Trans-Pacific Partnership” that could include all the Pacific Rim nations and economies one-and-a-half times larger than the European Union. The TPP negotiations are so secretive that the many protest organizations worldwide have not even been able to determine exactly where the government and corporate negotiators will be meeting. In light of such secrecy, one of the proposals floating around among the Occupy activists was for a giant car caravan that could cover large parts of the Metroplex and, eventually, go to wherever the negotiators eventually land. Such “flying pickets” have been successful in the past when geography was a problem. 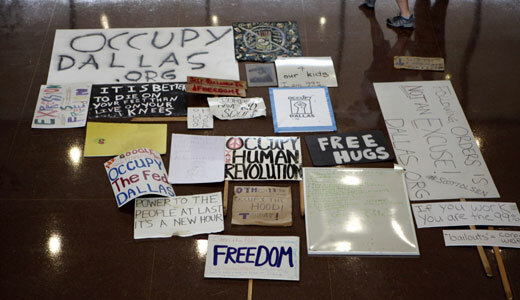 Occupy Dallas and Occupy Ft. Worth have continued with a strong pace of actions since Nov. 2011. In January, the main tent colony was driven out of the Dallas City Hall area, but public protests hardly faltered. Through the winter months, a growing trend of convergence among North Texas progressive organizations has been evident. The “99 percent Spring Trainings,” scheduled around the Metroplex for Apr. 14 are expected to further strengthen and unify the movement. One of the things they’re sure to talk about is the Trans-Pacific Partnership negotiation.